We're aboard the motor-assisted sailing ship Star Clipper, cruising the Andaman Sea, off the west coast of Thailand. It's a week-long roundtrip from Phuket, with stops at out-of-the-way beach islands and a port call at George Town, on the Malaysian melting-pot island of Penang. Here are some of our first impressions, both about the itinerary and Star Clipper, which holds the Guinness World Record as the tallest of all tall ships. As opposed to mega-ships that are like floating cities, aboard Star Clipper you are most definitely on a ship. The design is decidedly nautical, from the 85 compact cabins fitted with portholes and hung with pictures of sailing ships to the royal-blue color scheme and lacquered-wood trim. The huge main mast looms above, with crow's nests at two different heights, while intricate webs of lines serve to hoist the 16 sails. Giant coils of rope wait next to capstans, ready to winch vast swaths of canvas into place. 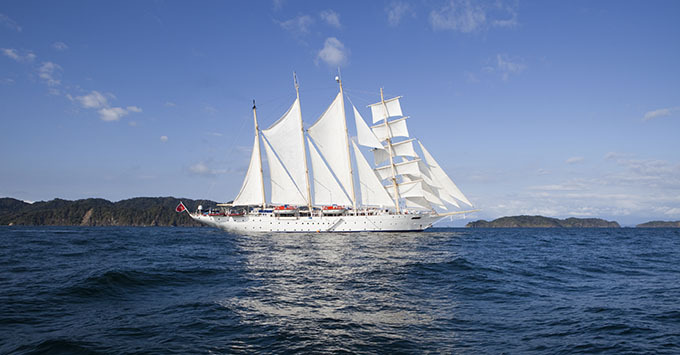 Star Clipper sails Southeast Asia, with an emphasis on water sports and beach activities. On our first morning at sea, we were invited to pick up net bags with masks, snorkels and swim fins, to keep for the duration of the cruise. Most of our stops have been anchorages, with wet landings," meaning that passengers take a tender to the beach and climb down a ladder into a couple of feet of water. Although Thailand's most popular islands, like Samui, Phi Phi and Phuket can be mobbed with tourists, our calls have been on beaches with few other visitors. The sports team deploys stand-up paddle boards, kayaks and little laser sailboats; in some destinations, they also offer waterskiing and wakeboarding. While sailing-ship passengers in times past survived on grog, hardtack and dried beef, we're happy to say meals have improved since then. Although the cuisine is more limited and less fancy than on the typical cruise ship, lobster tails, filet and baked Alaska did make an appearance at the Captain's Dinner. We've also had a beach barbeque and an Italian-themed lunch buffet. If you're looking for big-time entertainment, this isn't your ship. There's only one entertainer, a versatile keyboard artist/singer. 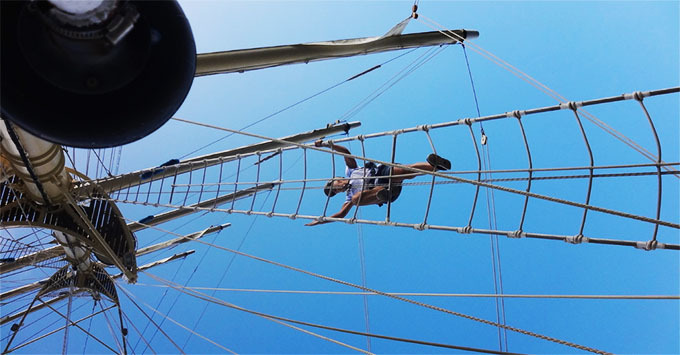 Instead, there are knot-tying or towel-folding lessons and an opportunity to climb up the main mast for a crow's nest view. A talent show one night highlighted crew members' singing and dancing, along with a few ribald skits -- but passengers were invited to take part, as well. On another night, local Thai entertainers came onboard. On our sailing, there are passengers from 10 different countries, including a large contingent of Germans and a few French-speakers, Australians, Brits and Belgians. Americans are in the minority, but English is the ship's lingua franca. However, announcements and instructions are made in German and French, as well. That can make things tedious during safety drills or briefings. On the brighter side, we get to practice our French on patient Parisians, and if the trip were a few days longer, we might even conquer a few words of German. A few days in, we realized that life aboard Star Clipper is a bit like summer camp for adults. There was Pirate Night, where the crew donned pirate hats and eye patches and stuck fake daggers in their belts. That may come off as a bit hokey if you're sitting on dry land reading this. But after a couple of tropical cocktails, it all seemed like good fun. The pirate-play continued with a contest where five passengers competed at various embarrassing challenges (hopping across the deck with a coin between their knees, for example) to be dubbed the winning "pirate captain." Several of the islands we've visited were jungle surrounded by beaches. 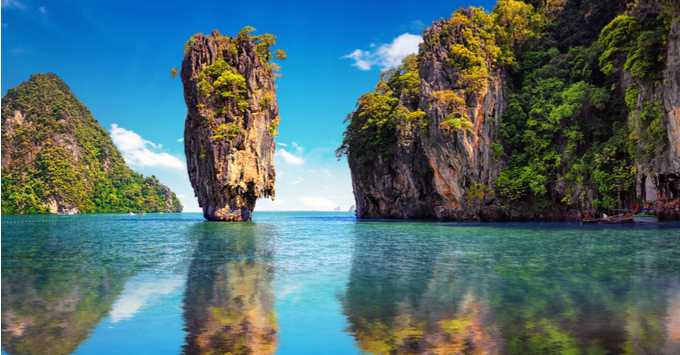 But Phang Nga Bay is another story. Here, the karst stone islands jut straight out of the water, some as high as 1,000 feet, with caves and stalactites. A few of the fantastical formations resemble animals -- a camel, for example. The more than 40 islands are part of a Thai national park, and sailing among them is truly lovely. Because Star Clipper has stairways, but no elevators, it attracts a more fit crowd. Although there is a lot of grey hair among our fellow passengers, folks are nimble enough to navigate boarding tenders and hopping off into the water at a wet landing. It means that there is less disparity during activities and everyone has walked at a similar pace during shore excursions. In addition to the included snorkeling equipment, Star Clipper also carries a dive instructor and diving gear. For an extra fee, you can take an intro-to-scuba course and go on additional dives (with certain limits), even if you're not a certified diver. For experienced divers, there are opportunities to dive at several locations. We took the plunge and really enjoyed the beautiful colors and plentiful ocean life -- as well as the confidence-building directions of the Canadian dive instructor. One conundrum of sailing ships is that the sails are always furled when they're at anchor or in port. That makes it nearly impossible to get those killer photos of the ship under sail. What to do? Star Clipper solves that by deploying three tenders for passengers to snap away as the crew hoists the sails. The tenders circle the ship so every angle is covered, and the crew even lines up on the bowsprit to wave. It's paparazzi heaven, even though you may have to throw a sharp elbow at that guy next to you to get his selfie stick out of your shot. We recommend that you spend extra time in the region, on either side of your cruise. There's much more to Southeast Asia than the beach scene, including the vibrant city of Bangkok and wonders like Cambodia's Angkor Wat. Once you've come this far, it would be a shame not to explore even further. Bangkok is a major hub for the rest of the region, with plenty of low-cost flights heading in every direction.